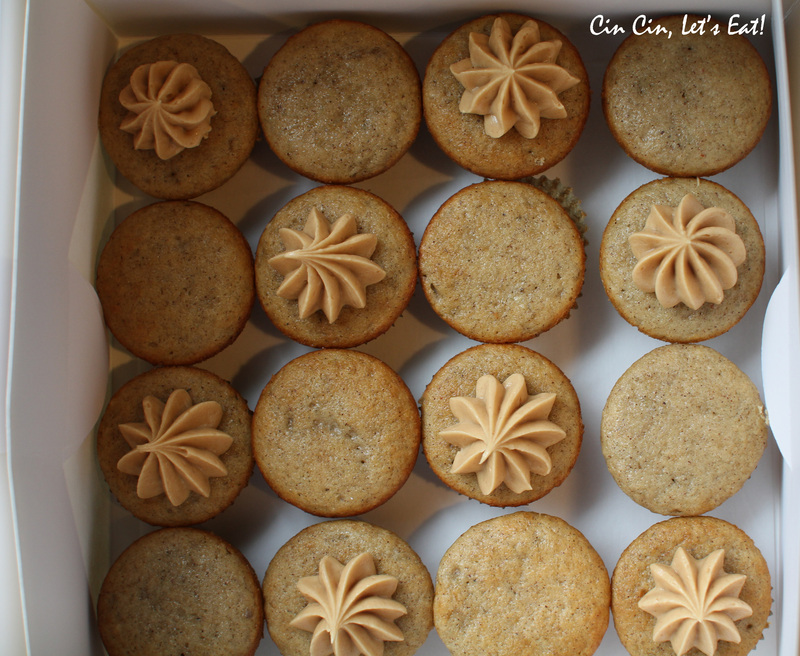 Peanut Butter Buttercream, Three Ways [recipe] – Cin Cin, Let's Eat! 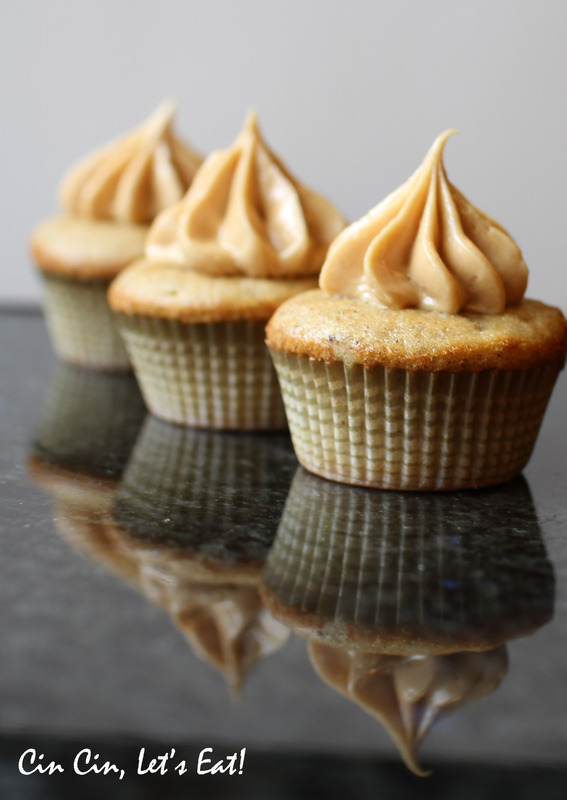 If you are a peanut butter lover like I am, you will love this easy recipe. It all began with reading about Bouchon Bakery’s peanut butter and jelly macarons. I’m such a sucker for peanut butter and jelly so immediately I had my mine set to make some. During my search for a good peanut butter filling, this super easy and well-tested recipe from Cook’s Illustrated stood out. After my first taste of a spoonful, I, along with all my “test subjects”, were immediately hooked. The perfect little hint of saltiness that came across was cherry on top. I also experimented with the texture by folding in some chopped roasted and salted peanuts at the end. Of course it might clog the piping tip so you will need to think about which piping tip is best suitable for whatever it is you are filling. In a standing mixer fitted with the whisk attachment, beat butter and peanut butter at medium-high speed until smooth. Add the confectioners’ sugar and salt to the bowl and beat at low speed just until the sugar is moistened. Scrape down the sides of the bowl and beat the mixture until fully combined. Finally, mix in the vanilla and heavy cream and beat to incorporate. Scrape down the sides of the bowl again then beat on medium speed until the frosting is light and fluffy. Pulse 1/3 of the powdered sugar and all the almond flour in a food processor to form a fine powder. In a medium mixing bowl, combine all dry ingredients. Sift mixture four times. Set aside. In a bowl of a stand mixer fitted with a wire whip attachment, whisk whites and cream of tartar on medium speed until foamy. Gradually add granulated sugar. Once all sugar is incorporated, scrape down sides of bowl and increase speed to high, whisking until stiff, firm, glossy peaks form. To complete the macaronnage step, sift the almond flour mixture 1/3 at a time over the egg white mixture and fold using a large silicon spatula until mixture is smooth and shiny. (Use the J-fold: Take the spatula straight down the center of the meringue, scrape then bring the bottom to top, like you are writing a “J”. Rotate the bowl 90 degrees and repeat. ) Once all the almond flour mixture is incorporated, check to see that the batter is nicely firm and drips slowly from the spatula. Transfer batter to a pastry bag fitted with a 1/2 inch plain round tip (#12) and pipe 1-1/3 inch rounds on parchment lined baking sheets. Rap bottom of each sheet on work surface to release trapped air. Let stand at room temperature for 45 – 60 minutes. Macarons are ready to bake when they no longer stick to a finger when lightly touched. Depending on the humidity, I’ve had macarons that took a couple hours to dry. Preheat oven to 375 degrees. Stack the baking sheet with the macarons on top of an empty baking sheet. Bake one sheet at a time, rotating halfway through, until macarons are crisp and firm, about 10-15 minutes. If the macarons are still soft inside, lower oven to 300 degrees, cover with aluminum foil and bake for a few more minutes. 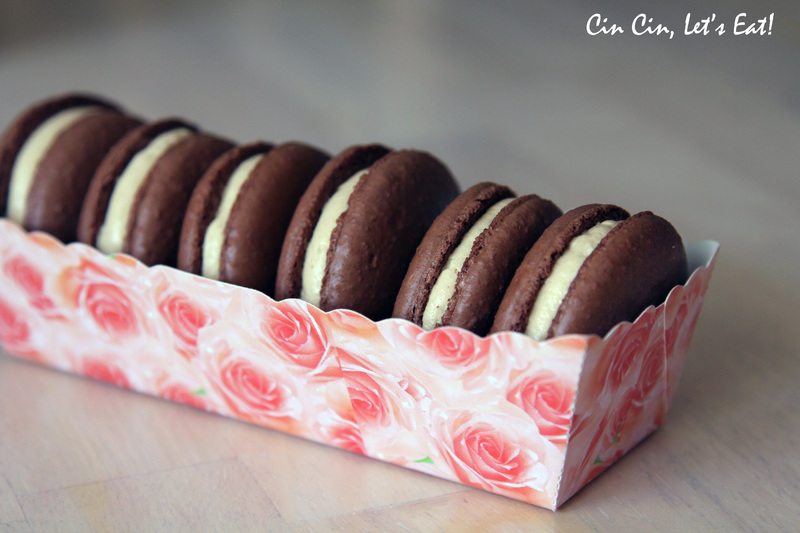 Transfer the buttercream to a pastry bag for piping or you can simply use a butter knift or spoon to fill the macarons. Pipe between two macarons. Spread one side of the sandwich with jelly. It is equally delicious without the jelly. Macarons can be refrigerated in an airtight container, bring to room temperature before serving. Check out this troubleshooting guide from FoodNouveau for any questions related to French macarons. 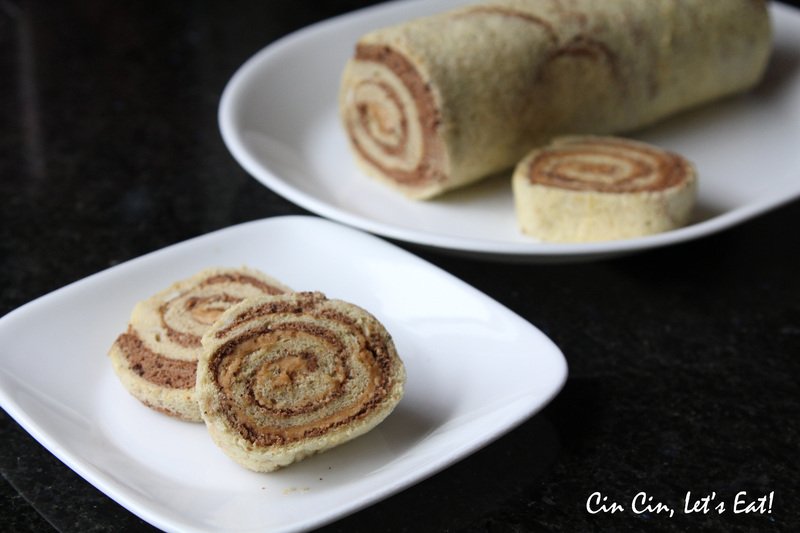 Swiss roll (aka jelly roll) cake has been on my to-make list for quite some time now. This is something I grew up eating, it’s a very common Westernized dessert sold in bakeries all over Taiwan. Soft and moist sponge cake, filled with a spread of anything sweet…cream, jam, chocolate, fruit, azuki (red bean) paste…etc. It’s a fairly light dessert, light enough for me to eat a slice with coffee for breakfast without feeling guilty about it. I’m still trying to master folding egg whites into the batter without over-folding, which was what happened here I think… I ended up with a not-so-fluffy cake that didn’t rise all the way up. 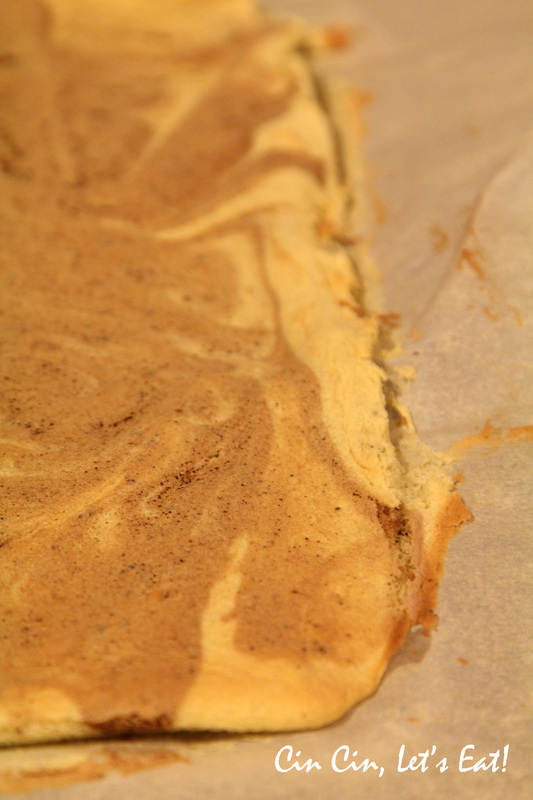 The swirling effect didn’t turn out as well as I thought probably due to the wrong consistency of the batter. But nevertheless it was light and yummy! Another thing to remember is that since every oven is a bit different, I will have to adjust the baking time for next time. This cake could’ve benefit a few more minutes in the oven. 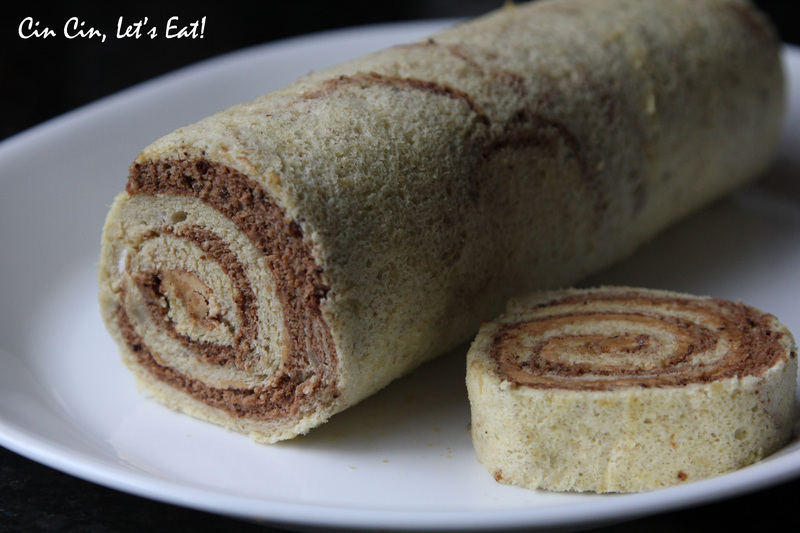 The cake had a bit too much moisture for my taste, while making it very easy to roll, it was hard to handle once it was rolled into shape. The crumbs stuck to my fingers kind of like how the shells of ice cream sandwiches would. To solve this problem, wrap the whole cake in plastic wrap and slice it that way. This was a delicious treat I baked up for a lovely lunch with A Curry of A Life. Check out her awesome blog! Hi i just wanted to say being a peanut butter lover as well i imediately tried out your recipe ! They all look so pretty. I adore peanut butter, but have never used it in baking. I intend to change this rather soon.